"A delicious holiday cookie that diabetics can enjoy as well." In a large mixing bowl , cream together butter and sugar substitute with an an electric mixer. Gradually add egg and vanilla while mixing. Sift together flour, baking powder, and baking soda. Stir in by hand. Finally, stir in sour cream and ground almonds. Divide dough in half and refrigerate for at least 2 hours. On a well floured surface, roll out each half of the dough to 1/8 inch thickness. Cut out cookies using a 2 inch round cookie cutter. 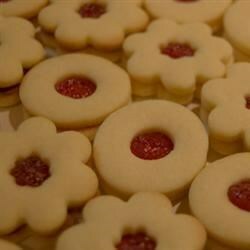 Using a 3/4 inch star or heart shaped cookie cutter, cut the center from half of all the rounds. Place cookies 1 inch apart on an ungreased cookie sheet and bake in preheated oven for 6 to 8 minutes. Remove cookies from cookie sheet and cool on a wire rack. To assemble: Stir the spreadable fruit until fruit so it is smooth. Spoon 1/2 teaspoonful of fruit onto each of the cookies without the holes. Set a cookie with a hole on top of the fruit layer. Enjoy! Overall a pretty good cookie. Watch the artificial sweetener that you select as some leave a bitter aftertaste. Excellent cookie that everyone just loves. I make them quite small with 1/2 of them raspberry preserves and 1/2 apricot preserves. Both work great.